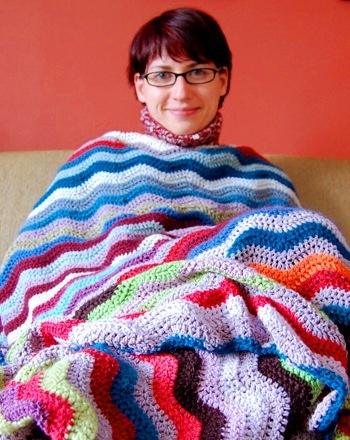 Kim Werker is a big name in the world of crocheting. The founder of Crochet Me, onetime editor of Interweave Crochet (during whose term the magazine blossomed into an inspiring quarterly publication), co-host of Knitting Daily TV, and author/mastermind behind a sizable stack of crochet books as well as a designer in her own right, she has made it her mission to bring cool crochet to the people. I’ve mentioned before that I have Kim to thank for getting me into designing and that I never would have started Crochetvolution without my involvement in Crochet Me, so I am excited that I had the opportunity to interview Kim via email for our one-year anniversary! MELISSA: Okay, Kim! When and how did you begin crocheting? KIM: Though I first learned in high school and then again in college (both times from a friend), I didn’t really begin crocheting until my mid-twenties. After I’d learned to knit, I decided it was time to learn to crochet as well. Imagine my surprise when I discovered I actually already knew how. MELISSA: What made you decide to start Crochet Me? KIM: Back in 2004, the knit-blog world was growing rapidly, Knitty was already around, and there were other knitting magazines starting. 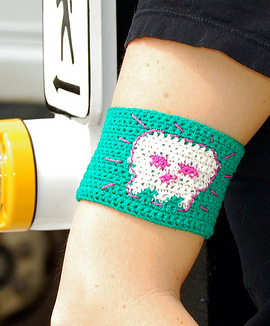 When I properly took up crochet, I was excited to see what was going on online for this craft, too, but I came up empty. The Crochetville message board was just starting out, and I decided that though I didn’t yet have the skill to design crochet patterns, I did have the skill to put a website together that wasn’t hideous or hard to navigate, and so I started Crochet Me one Saturday afternoon. MELISSA: Were you expecting anything like response you got? MELISSA: What’s the best experience you had while running Crochet Me (if there was one)? KIM: I couldn’t single out just one. Learning that Interweave was interested in a book inspired by the site was huge, though. I phoned my mom from the trade-show floor that day. If we look beyond individual experiences, there are two things about Crochet Me that always make me smile: That we helped foster innovation and learning in crochet, and awareness that the craft has infinite potential in fashion; and that I formed friendships and business relationships with people all over the world I never would have met if not for Crochet Me. MELISSA: You spent some time as the editor of Interweave Crochet. Can you tell us more about that? KIM: I was the editor of Interweave Crochet from the end of 2006 to the end of 2008. Before I came on, Interweave had published a couple of special crochet issues of Interweave Knits, and they hired me as the first full-time editor of Crochet when they decided to make it its own quarterly magazine. It was a super exciting, tremendously educational time for me. MELISSA: How do you feel about the direction Crochet Me went in after regular publication ceased? KIM: When I became editor of Interweave Crochet, I oversaw the change in direction of Crochet Me. Up to that point, I’d published Crochet Me quarterly, and I just couldn’t be the editor of two publications at the same time. So I shifted Crochet Me into a more social site, where anyone could post their own patterns, tips, etc. Of course I kept the archives live, too. After five years of living and breathing crochet, I desperately needed a break. 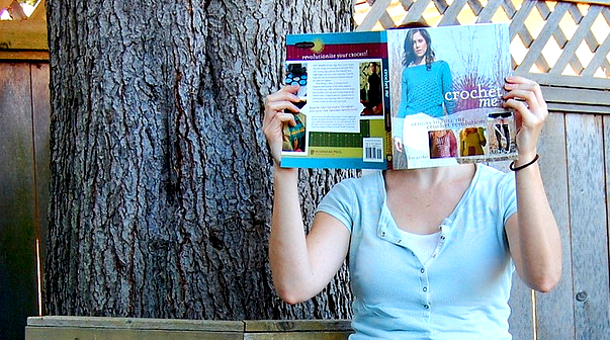 When I left Interweave Crochet at the end of 2008, I also sold Crochet Me to the publisher. MELISSA: You’ve been involved in so many crochet-related projects, from Crochet Me to Interweave, books, Knitting TV, and more. Do you have a favorite project? What is it and why? KIM: Oh, Crochet Me is totally my favourite project of my crochet work. Collaborating with dozens of people from all over the world, we created something totally new and we made an impact. Not only that, but my experience with Crochet Me led me to develop skills I now use every day in my work, whether that work is crochet-related or not. I became thoroughly fluent with online communication, I became a better writer, I learned how to edit professionally, and I learned countless things about myself. That I love to collaborate, that I’m crap at tedious things, for example. MELISSA: What are you doing these days? Do you have any projects that you’d like to share with us? KIM: These days I’m doing some freelance editing, but my main love is a project I started a couple years ago called Mighty Ugly. I hold workshops about creativity and how we hold ourselves back from trying new or big things. I’m cooking up some video projects I’m really excited about, and I’m hoping to write another book soon. I blog at kimwerker.com. MELISSA: What kind of book? KIM: I’m working with my agent to find a home for a book about creativity. I know that’s super vague, but it’s hard to go into detail when I’m not sure yet if it’ll get written. Fingers crossed! MELISSA: Do you still crochet much? KIM: Oh, of course. I just crocheted my friend Kyla a wedding shawl, and I’m about to start a wedding shawl for another friend. 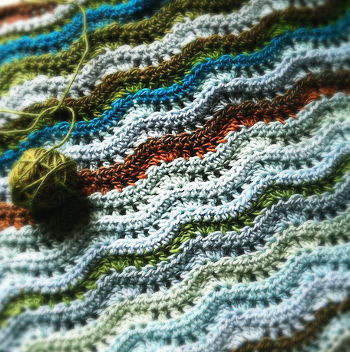 And I designed a baby blanket pattern I’m hoping to have ready for sale soon. I keep track of all my projects on Ravelry as kpwerker. MELISSA: Thank you for agreeing to the interview, Kim! It was great to talk to you!